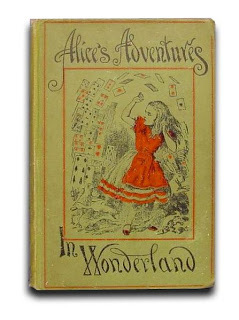 With all the Alice in Wonderland talk as of late, I decided to read the original by Lewis Carroll. I chose to listen to it via audiobook while I was doing other things around the house. There are several free online versions so it's not hard to find. If you don't know, and I think you do, Alice falls down a rabbit hole and encounters many strange creatures. The story is of her adventures there and how she interacts with those creatures. It's pretty weird. I read the tea party part to my daughter and she said, "What are they talking about?" which is about how I felt as I listened to it. It was especially disconcerting to hear a grown woman singing a nonsense song in a silly voice. So, I don't know. It's a silly story full of nonsense and some clever word play. I thought some of it was fun and sympathized with Alice. What a crazy place to end up. I became interested in Alice in Wonderland recently after reading Alice I Have Been by Melanie Benjamin (click for my thoughts). Benjamin tells the story of the real Alice, Alice Liddell, and her relationship with Charles Dodgson (Lewis Carroll). I recommend reading it. I don't know how I couldn't recommend this classic story. Just know that it's totally ridiculous.